I recently got my closed beta invite for Sony’s new family-friendly MMORPG Free Realms and spent half an hour this afternoon checking it out. Sadly I can’t say much more about it as I’m under NDA but (rather oddly) they encourage beta testers to post feedback to the forum — which happens to be entirely public! 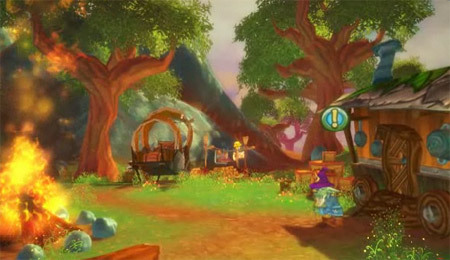 As I suspected from the trailers and videos I’d seen it’s very much a World of Warcraft “Lite” — but not in a bad way. They’ve taken a clearly winning formula, cutesied the style and remarketed it for a younger audience, adding a multitude of minigames and making character classes something your can switch between as the need arises, rather than choosing just one. Free Realms is and will be, as the name suggests, free to play although you can “upgrade” for a $4.99 monthly fee to access an assortment of extra features like the ability to have more than one character and members-only items and quests. The beta is currently PC-only but it’ll also be available on PS3 later in the year. After checking out Sony’s PlayStation Home earlier in the year and feeling distinctly underwhelmed I’m very pleasantly surprised by what Free Realms has to offer. Maybe Sony should ditch the Home team and get these guys in instead. If you’re on there, look me up. I’ve called my character, not entirely voluntarily I might add, Trevor Flamingtree (login required).